For Intro Educational Technology courses. 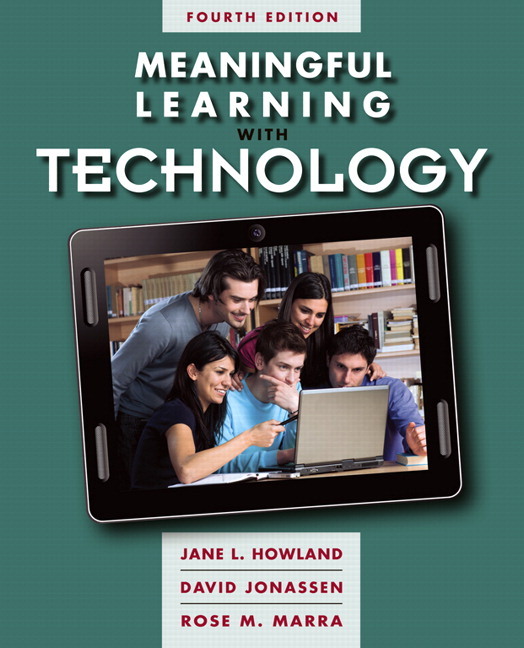 Grounded in constructivist teachings, this popular text demonstrates how teachers can use technology to engage and support meaningful learning of their students. Organised around learning processes such as inquiring, experimenting, writing, modeling, community building, communicating, designing, visualising, and assessing, Meaningful Learning with Technology, Fourth Edition, demonstrates for the reader how learners can use different technologies for meaningful learning. Numerous examples from teachers in K-12 classrooms, give readers a clear understanding of how technology can be used with different types of students, including expanded coverage of effective technology use with young learners. All chapters now present learning objectives as well as ISTE NETS for Students and 21st Century Skills that may be met through the learning activities described. The text is further strengthened by the inclusion of practical application with technologies that many teachers currently use; discussion of widely available web-based tools for learning and collaboration; and the addition of Assessing Meaningful Teaching and Learning rubrics which give readers a tool for reflecting on their practice. Each chapter extends learning by culminating with questions and issues for readers to think about. NEW! Chapter 1 features a review and discussion of three alternative conceptions and standards for meaningful learning. The inclusion of the ISTE NETS, 21st Century Skills, and Technological Pedagogical Content Knowledge or TPACK (with an additional Learning Knowledge dimension proposed for the TPACK model) helps students gain understanding of major educational technology and learning standards. NEW! In every chapter of the fourth edition, students will see specific examples of how various types of learning activities can align with specific NETS and 21st Century Skills. NEW! The addition of Assessing Meaningful Teaching and Learning rubrics in Chapter 10 provides students with the tools they need to begin analyzing and assessing the quality of their teaching. NEW! A strong focus on social educational networking and Web 2.0 tools for learning and collaboration, found throughout the text, demonstrates to readers how the most current technologies can enable teaching and learning. See examples in Chapters 5 and 6. NEW! Chapter 2 features an expanded section on information literacy skills such as evaluating web resources, and online privacy and safety issues. The inclusion of these special sections builds awareness of critical issues involved with information literacy and prepares students to deal effectively with them as classroom teachers. NEW! Each chapter now begins with a list of Chapter Objectives that will prepare readers for what they can expect to gain from the chapter content to follow. NEW! Examples given to support the learning technologies described in the text have been updated to feature more primary grade elementary students’ meaningful learning with technology. An increased emphasis on high quality, practical application of technologies that many teachers currently have available and use for instruction, such as interactive whiteboards, PowerPoint, and more, offers readers ideas that can be directly applied in the classroom. Focus on how a learner uses technology for meaningful learning and how this informs instructional practices in the classroom through a constructivist approach. Readers learn to coach the learning of technology skills that encourage students to experiment with technologies, articulate their own beliefs, and construct, and co-construct ideas to build knowledge. Jane L. Howland, Ph.D., is an Associate Teaching Professor in the School of Information Science and Learning Technologies at the University of Missouri. After teaching kindergarten and multi-age classrooms at the Stephens College Children’s School, Dr. Howland earned her doctorate in Information Science and Learning Technologies from the University of Missouri. She has developed and teaches graduate courses related to the use of learning technologies, with an emphasis on K-12 learning environments. Dr. Howland’s current work focuses on designing and evaluating online learning environments in K-12 and higher education. She has been PI on federally funded research projects related to faculty development in using and modeling technology use with preservice teachers and with K-12 teachers’ use of technology for assessing student learning. Dr. David Jonassen is Curators’ Professor at the University of Missouri where he teaches in the areas of Learning Technologies and Educational Psychology. Since earning his doctorate in educational media and experimental educational psychology from Temple University, Dr. Jonassen has taught at the University of Missouri, Pennsylvania State University, University of Colorado, the University of Twente in the Netherlands, the University of North Carolina at Greensboro, and Syracuse University. He has published 35 books and hundreds of articles, papers, and reports on text design, task analysis, instructional design, computer-based learning, hypermedia, constructivism, cognitive tools, and problem solving. His current research focuses on the cognitive processes engaged by problem solving and models and methods for supporting those processes during learning, culminating in the book, Learning to Solve Problems: A Handbook for Designing Problem-Solving Learning Environments. Rose M. Marra, Ph.D., is an Associate Professor at the University of Missouri in the School of Information Science and Learning Technologies. Dr. Marra teaches courses on assessment, evaluation and the design and implementation of effective online learning experiences. She holds a Masters degree in Computer Science and worked as a software engineer for AT&T Bell Laboratories before completing her Ph.D. and beginning her career in academia at Penn State University in their College of Engineering. At Penn State, she began her advocacy for and research into women and girls in STEM careers. Specific research interests include factors that influence persistence of women in STEM, women’s self-efficacy in studying and completing STEM degrees, gender differences in perceptions of STEM classroom climates, and the epistemological development of college students. Dr. Marra has been PI or Co-PI on numerous funded research projects including the Assessing Women and Men in Engineering (aweonline.org) and the National Girls Collaborative Project. By: Roblyer, M. D & Hughes, Joan E.